Experience is the thing which is on the top in the mind of the hoteliers these days. The most important consumer expectation is for authenticity, a desire to be treated with personal care and uniqueness. For a long time, the hotels have been offering only the basic amenities but with time travelers expectations have changed a lot. Products and services which the hotels provide to the customers will entice the customers towards the hotel for future. Among all these amenities, Toiletries are one of the basic amenities which often goes ignored and remains an afterthought. But the truth is the toiletries can be used by the travelers to form an opinion about their stay and even about the hotel. Hotel chains across the globe have started focusing on the quality of toiletries they provide by upgrading their shampoos, conditioners, body lotions, and soaps to top-shelf brands. Essential basic toiletries which are found in any hotel are cleansers, towels, and tissues. Hotels giving the best quality of toiletries supplies to the guests create a positive impact on the travelers about the hotel. The best place to focus on toiletries and provide numerous products to customers is the bathroom. There are products like tissues, shampoos, conditioners, shaving creams, hand washes, hand towels and so on which can be provided as complimentary service products to the travelers so that they can revisit your hotel again and also recommend it to their family and friends. Furthermore, hotels that provide luxury products as toiletries to their customers are often seen as classy establishments contributing to the overall image in the market. 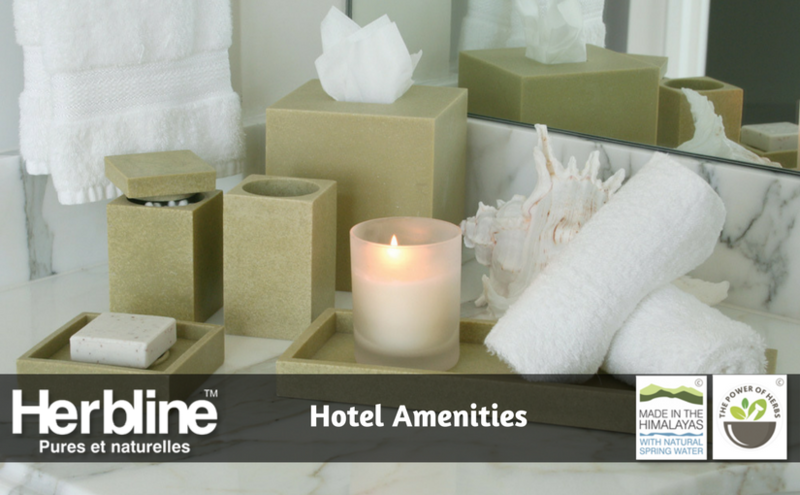 Herbline being the manufacturer of 100% pure and natural products provides toiletries supplies to the hotels from moisturizers to shower gels. The products from Herbline are so natural and skin friendly that they make you feel at home with amazing results. Herbline has designed a special range of toiletries for hotels as well with names of hotels like Marriott Range, Ginger Lily range, and ITC range. The shampoos, cleansers, and moisturizers from Herbline are specially designed in a way to be the best bathroom accessories. Moreover, the luxury amenities have natural aromatic oils and nourishing salts used in them which make them 100% natural and safe for any type of skin. The collection of moisturizers from Herbline contains great skin friendly ingredients with the goodness of natural ingredients which will leave your skin smooth and soft. With a wide range of hotel toiletries available from Herbline one of the leading suppliers of the best quality of hotel toiletries, you can win the trust of the travelers in your hotel which will impact the branding of your hotel in the best positive way. Moreover, these products from Herbline will help the hotel to create a home away from home even for the global travelers.